If there’s one thing you can expect to find in Sin City, a.k.a. Las Vegas, it’s sin, and crime. It’s easy to be distracted by the brightly colored lights and intoxicating scent of green bills, but in Mysterious City: Vegas, your professionalism will be put to the test. Your challenge? A little less gambling and a little more thief catching! Mysterious City: Vegas begins with a summons for you to use your detective skills to investigate a local hotel & casino theft in Las Vegas. The man who greets you on arrival is chief security inspector Mr. Ferguson who refers to you only as Dr. Ellis. As for what sort of Doctor or what kind of an investigation is at hand, that’s still unknown at this stage. The story is told using typical comic-like screens, but unfortunately there aren’t many of them, so the storyline doesn’t appear to be one of the game’s best features. However, where the storyline falls short, the in-between-level mini-games are a pleasant surprise and not at all typical of most hidden object games. For example, the opportunity to play poker or bingo between search screens is a fun (but harmless, it’s just a game folks!) casino-style treat, so you could definitely say that there’s some “Vegas” in this game! It’s all presented in a very user-friendly way, so even if you’ve never played a single poker game in your life, you needn’t worry, you’ll get the hang of it in no time. 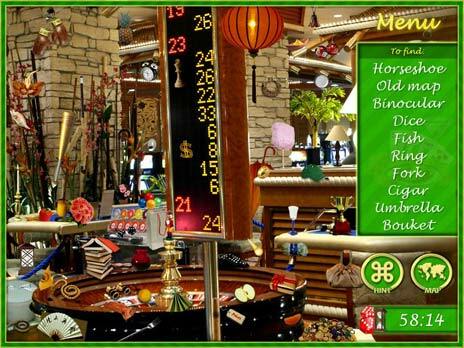 And if you decide you like them SO much, there’s always the option to play any of the gambling games from the main menu. There are also a few other mini games such as jigsaws, finding differences between two similar pictures and so on. 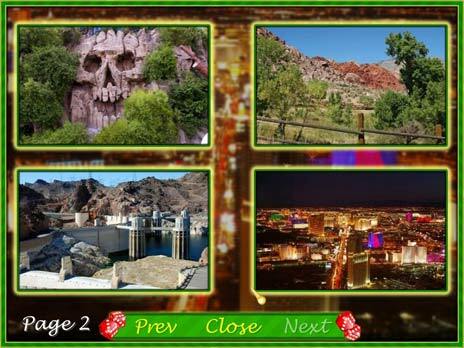 Most of the search scenes consist of different casino rooms and other famous sites from Las Vegas. The items to be found are hidden in the background very well, maybe even too well sometimes, forcing you to invest a little more effort in order to find those sneaky scissors, but hey, if it didn’t challenge you just a little bit, it wouldn’t be particularly rewarding when you do finish a level, now would it? 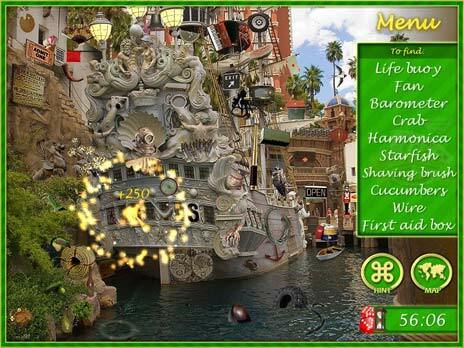 As with most hidden object games, “time” and “relaxed” mode are available, but in this case, it probably doesn’t really matter, since you’ll get about 45 minutes to complete every level in Mysterious City: Vegas, so if you’re a bit of a hidden object pro, that should be more than enough. 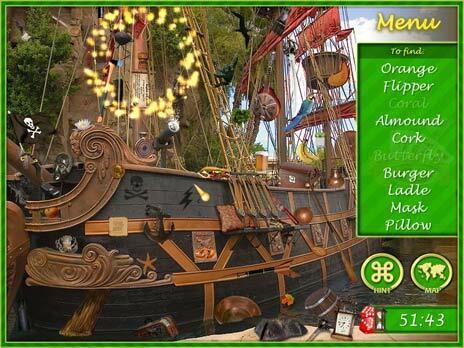 Frankly you could probably hint your way all the way through, since taking a hint only cost you 2 minutes, but doing so will probably hurt your total score at the end of every level, so if scoring highly is one of your priorities in hidden object games, you might want to stick to finding objects “the hard way”. Download and play Mysterious City: Vegas for FREE. The Mysterious City: Cairo & The Mysterious City: Prague.